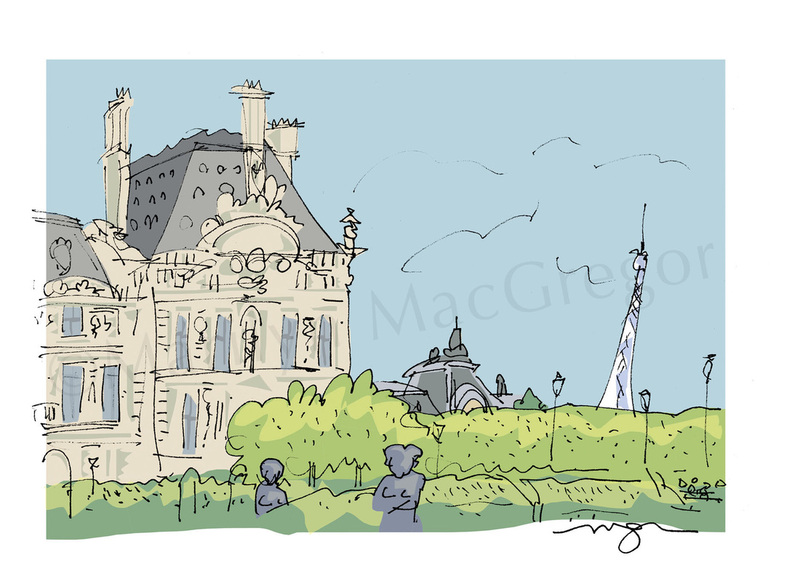 I’ve been in France for a couple of weeks; some business having to do with my ArtSmartTravel tours, a good deal of drawing in order to add more Paris and France to my MacGregor-Art International Series of fine art prints, and also just to be here in a place I love and know well. I never expect much from the weather but this time it has been just as beautiful as the city of Paris and the countryside of France. I’ve spent some time in museums, of course – a small Rembrandt show at the Jacquemart-Andre Museum, a retrospective of Fantin-Latour at the Luxembourg, a few hours in Lyon’s Musée des Beaux Arts and, yesterday, the Louvre. There is always something new to learn, but especially at the Louvre it was kind of an Old Home Week, a chance to revisit works I may or may not love outright, but taught for long enough to feel on intimate terms with them. The most enjoyable part of the Louvre, as in most big museums, is finding the quiet corners with interesting works that are able to speak clearly without having to shout over the crowds. I had that pleasure when I came across a gathering of paintings by Jean-Baptiste-Siméon Chardin, who lived and worked in the 18th century, a time when most artists were under the heavy thumb of academic strictures. 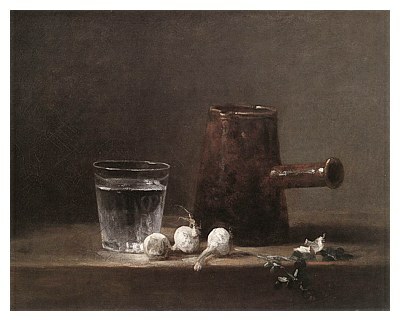 Unlike most of his contemporaries with their grandiose portraits and history paintings, Chardin created small quiet genre scenes and still lifes. Yet, despite swimming against the Baroque and Rococo tides, he prospered nicely; Diderot, eminent spokesperson for the Enlightenment, was especially fond of his still lifes. Chardin is a great role model for artists – for me he reminds me that my way of working is my way of working. I treasure as subjects things often overlooked or thought unimportant in the grand scheme but which reveal everything about human existence on earth. I have a sophisticated understanding of art periods and the context of art in world history, but I love above all the simple spontaneous act of drawing, both in my own work and in that of others. As I get older, with my drawing, I’m less inclined to worry about every small detail – I like hinting rather than spelling out, and work to capture the energy of life as it speeds by. If it means that my drawings look tossed off, well some of them are – I work very quickly, with the confidence of long practice – and I also cannot help that a bit of whimsy invariably makes its way into my stew of lines on a page. But what better definition of life? Life goes by too fast, and to make it through we do best to keep a sense of humor. At the risk of hubris here are a few words about a typical Chardin and then one of my drawings. Try to look at this little painting with 18th c eyes – what could possibly make anyone care about it when there are so many grand canvases? This still life is so mundane and dull – no silver knife, no flowers, no crystal glass of wine. But it is exquisitely painted with a mastery of form and texture, and there is much more to see than meets the initial glance. Water, for example – the simplest of substances presented in a simple glass – but nothing simple about our need for it: life doesn’t exist without it. A copper jug, banged up a bit by use: I think that’s us, battered and dropped by life now and then, but still of use as we age. A few turnips? Sustenance, if not luxury. And air? As invisible in reality as it is in this composition, but crucial in both instances. 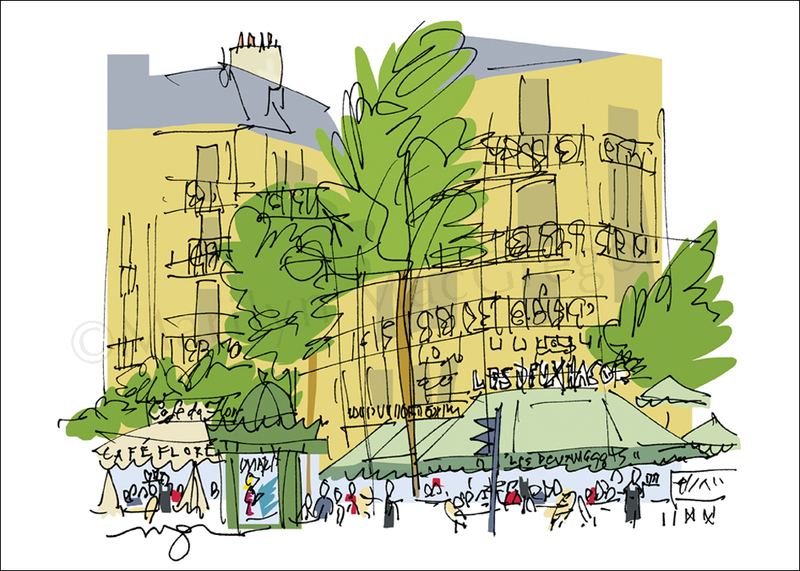 Again, I’m no Chardin, but here is one of my Paris scenes, created from a sketchbook drawing on an earlier trip. Chardin, who was born in Paris and never in his life traveled, would recognize the Louvre – sort of. In his day the Louvre was run-down and practically abandoned because the Bourbon Kings didn’t care to live in Paris. The Louvre we know today – even without the 1970’s pyramid – is a clean, majestic dream destination for art-lovers. So my drawing, while very different in subject from Chardin’s Water Jug and Glass, contains its own layers. The grandiose history of the Louvre is represented, or at least implied, by my sketch of the façade in its ornate sculpted Renaissance splendor. The pyramid by I.M. Pei serves a practical purpose as the principal entry to the Louvre, but as all photographers know, it is most exciting for the reflections of the historical Louvre that surrounds it on three sides. The Louvre Pyramid adds a major contemporary note while also emphasizing the grandeur of the original structures. And, in my drawing as in Chardin, there ‘we’ are, resting our weary tourist feet, calming our squalling children, snapping selfies, conscious or unconscious of the looming presence of kings, great art, great architects, historical events and deeds filling the space all around us. Watch my website ﻿www.macgregor-art.com﻿ for new International Scenes as well as my Philadelphia series and my happy tribe of Dogs and Cats. My 2016 began with a great deal of gratitude for 2015, when I had the tremendous pleasure of leading several wonderful tours to amazing places. Paris Arts & Pleasures in May was, as it is designed to be, a sumptuous feast of fun and delight. In July I was in London, Northern England and Western Scotland, co-leading a Celtic Pilgrimage to ancient British sites of wonder and deep significance. October, a golden time anywhere, was especially so in Burgundy, France, the setting for a custom week for a group of friends - a week of hallowed vineyards, small villages, great food and wine, and world treasure sites. 2015 came to a close in Spain with a 4th trip, this one with my small beloved family. On each of these trips, as always, I soaked up so much learning, so many new perspectives, so much delight in a world that, despite constant struggle, is a place of great kindness and beauty. I'm hoping you'll be inspired to join me on a tour this year or next. Paris Arts & Pleasures is a full menu of good food and wines, cooking classes, markets, gardens, contemporary art, special insider visits to some of Paris's best secrets and more! Paris & Cathedrals, in Autumn, is a great combination of exciting modern Paris and history, art and architecture at their most profound and significant, with a stay in central Paris and the fun of day trips to three different cities visiting Cathedrals of while also sampling local traditions and cuisine. I am offering the Burgundy week as a custom trip particularly suited to family and friend groups who wish to have an adventure in a beautiful place where they can relax together in a cozy home environment. The time of the tour can be arranged to suit the group. Finally, I'm excited to add a new trip by request, in response to my pictures and descriptions of Andalusian in the south of Spain. This is a spring tour, set for April 2017, when the orange trees are in bloom and the weather is not too hot. This area of the world is incredibly rich in history and beauty, a mix of cultures and styles that is unique in Europe - it will be a wonderful place to explore together. Click on the red names to read more about each tour. Contact me with questions, for further testimonials from people who've traveled with me, and to let me know your interest in an ArtSmartTour.